Roller blinds are a good option when you want to minimise the amount of light lost, want a very clean finish, or want to cut out the light or protect furniture. Blackout roller blinds can be used behind existing curtains if you need the room to be darker. Decorative fabrics, such as velvet, or details, such as crewelwork or embroidery, can’t withstand the laminating process, so you can add extra decoration elsewhere. 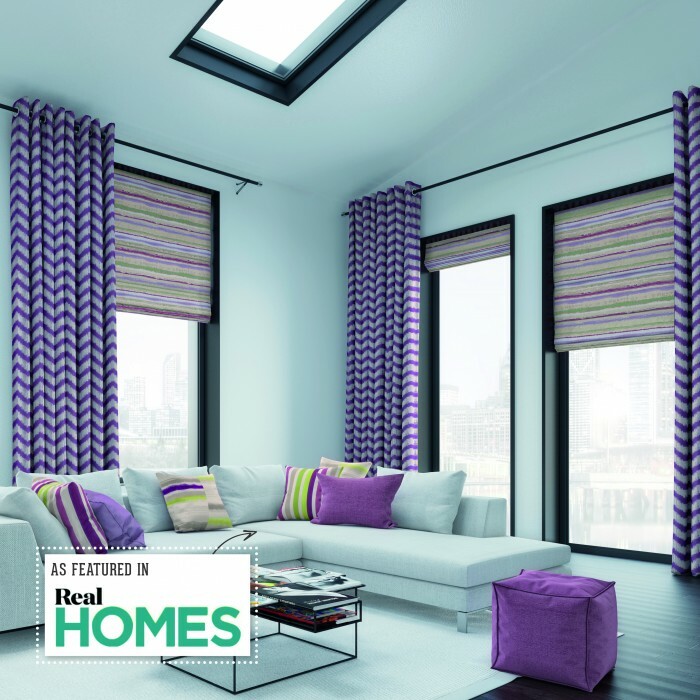 Roman blinds are suited to the majority of fabrics and can fit inside or outside the window recess. When they’re down, they should sit flat with no discernible stitching to the face of the fabric to ensure a smart finish. There are some lovely extras that you can add, such as pretty trimmings, pom pom fringes or contrast binding, to create a beautiful and decorative addition to your room. Use a colourful mix of curtains and blinds to form the backbone of your design – ideal for a bedroom that’s otherwise decorated in soothing shades. A combination of geometrics and strips in a fresh, modern way to layer patterns, but any prints in similar colours that have a difference in scale will harmonise. Cocoon a bedroom further by adding blackout lining to your blinds.